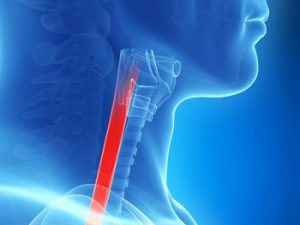 Are you feeling as though there is tightness in your throat, or difficulty swallowing, as though there is a blockage in your throat or esophagus? Today there is research demonstrating the cause may be an autoimmune response. At one time, I myself was troubled with this condition. For about a year I had a very uncomfortable swallowing disorder, experiencing difficulty each time I tried to swallow. This chronic problem caused me to visit a specialist as my throat condition was becoming worse and I needed to find a solution. I explained to an ears, nose and throat specialist that it felt as though I had to swallow around a small rock. The ENT examined my throat with a short scope and could not provide an answer. The failure to resolve my condition spurred me into action. Now I knew something had to be done and I also knew specific therapeutic grade essential oils are known to support the immune system in resolving resistant infections. They do so by dissolving microbial plaques known as biofilm. It took around 6 months to dissolve this microbial biofilm and infection. Consistent application of the “Hamel Method” which includes the Five Portals to healthy longevity was key to resolving my swallowing condition. Now when I swallow I no longer have a blockage at my upper esophagus. My wellness protocols work. If you are suffering with this concern and would like to learn more, call the office today to set up your wellness consultation: (407) 628-2176. My name is Michelle Hamel. I am a Certified Wellness Consultant, Clinical Aromatherapist and Medical Massage Therapist. When you understand your body, how it works, how and where disease imbalance truly begins, you have a road map to a life free of premature cellular degeneration and aging. Empower yourself with the knowledge I share. Give yourself and your family the gift of long, vibrant and energetic life. Accomplish robust life extension by implementing the Hamel Method which includes The Five Portals Of Health. These wellness protocols provide the health blueprint I created to build healthy longevity. As a Certified Wellness Consultant and Clinical Aromatherapist I provide powerful health strategies to assist you in maintaining or regaining healthy balance. Call me at the office today (407) 628-2176 for your free 20 minute wellness consultation. Consulting with a Certified Wellness Consultant is very important. A wellness coach trained also as a Clinical Aromatherapist guides you with a customized health plan. Your coach provides you with the knowledge to successfully utilize specific wellness protocols to positively change the course of your health. A Clinical Aromatherapist ensures you obtain only pure therapeutic grade essential oils, eliminating the dangers of obtaining essential oils with chemical solvents and other toxins. Additionally, the essential oils you are purchasing must contain the necessary constituent compounds found in the correct order to enable powerful health results. Review the links below to learn about specific soft tissue problems and the soft tissue solutions I provide. Thousands have recovered using my proprietary soft tissue methods. With my specific soft tissue therapy expect to be well within one to five treatments. Within your first treatment you’ll obtain great results and many times total relief of your pain. You will know you have chosen the right path. I guarantee that you have great results within your first treatment. My clients avoid painful surgery and nerve blocks. They are able to eliminate the need for various prescription drugs. If you suffer from disc pain, damaged joints or pinched nerves, you have found the answer to your problem. Contact me for more information about my work.